Gemalto, the world leader in digital security, and IER, a leading designer of solutions that improve the flow of goods and people, have teamed up to create Fly to Gate, an end-to-end self-service airport experience for travellers. Airport travel is booming; in 2016, there were 3.8 billion passengers and the International Air Transport Association (IATA) expects this to double by 2035. This means that the industry and authorities will need to deploy automated solutions to optimize the flow of passengers while guaranteeing stringent security. Fly to Gate answers the growing need for a self-service experience that takes travellers smoothly from their home to the departure gate. A typical Fly to Gate departure solution gives the traveller the choice between mobile check-in or self-service kiosks and includes bag drop points, border control, security and boarding gates. 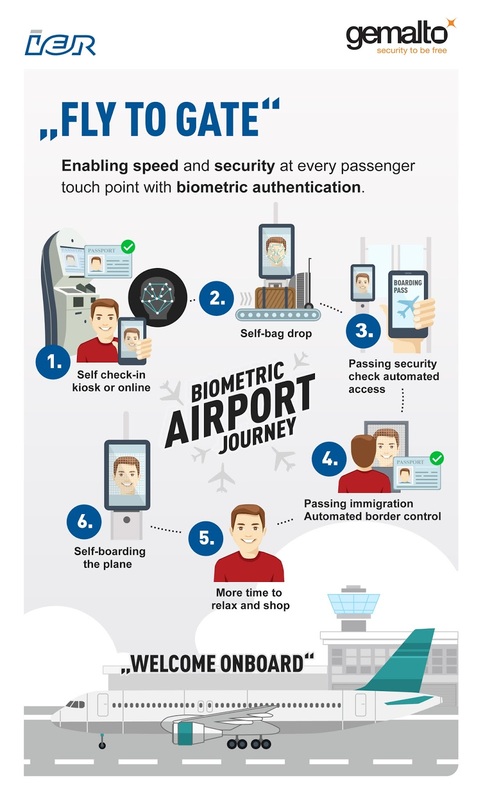 Fly to Gate supports multimodal biometric verification including facial recognition, robust document verification and straightforward integration with immigration systems, enabling rigorous standards of security and outstanding operational efficiency for airports and airlines.